Today’s ASX listed microcap stock appears be shaping up for a big 2017. Currently capped at just $5.5 million, this company has just raised $1.2 million, and recently completed its maiden gold drilling program near Kalgoorlie – the results of which will drop at any moment. It has also just acquired a Canadian cobalt project with multiple occurrences of cobalt bloom, and has a large advanced zinc project, but it looks like the market hasn’t quite factored in the value of these projects. However, all that might be set to change very soon. Particularly with a new CEO appointed recently to ramp up activities. This company’s Trojan Gold Project sits around 50km from Kalgoorlie, home to the 50 million ounce plus Kalgoorlie super pit, and a sprinkling of other multi-million ounce operations that dot the landscape. This isn’t an entirely greenfields exploration play; the company’s Trojan Gold Project has already seen some production, having previously delivered 130,000 oz. of gold, and this ASX stock is looking to re-start it. Two open-pit mines have already been built at its operational site in WA, and with its maiden drilling program recently completed, this stock is hoping to quickly expand production. The current total JORC resource stands at 2.8Mt @ 1.6g/t Au (inferred and indicated). With both pits open at depth and along strike, imminent drill results could quickly capture the wider market’s attention. Although, it is worth noting that this is an early stage play and investors should seek professional financial advice if considering this stock for their portfolio. Given it’s been mined before, it will take much less time and require minimal cash for this company to start generating cashflow from its gold resource. Meanwhile it also has its hands on a shallow, high grade, and very large, zinc project. Currently bulging at 12.6 Mt @ 5.3% zinc and 0.9% lead, and with deposits open at depth, this small ASX stock will likely be hunting for JV partners on this zinc play. 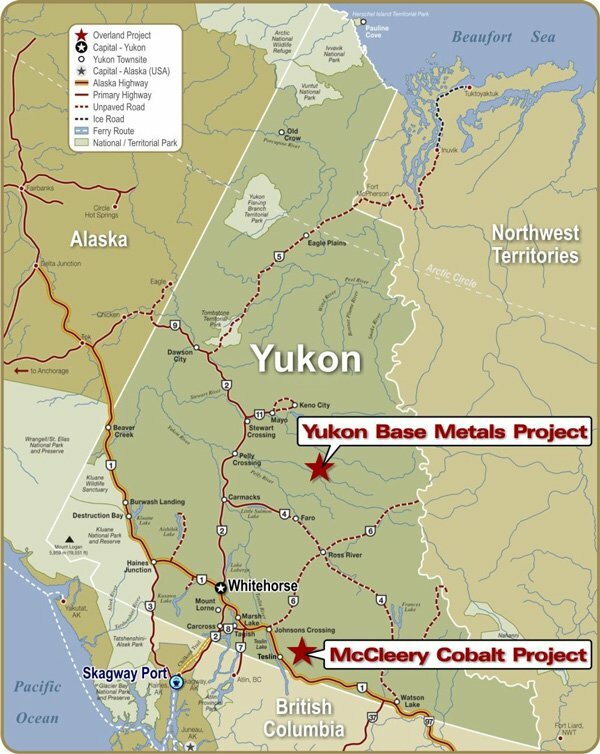 The final piece of the puzzle came earlier this month, when the company acquired 100% of the McCleery Copper-Cobalt Project in Canada’s Yukon Territory. 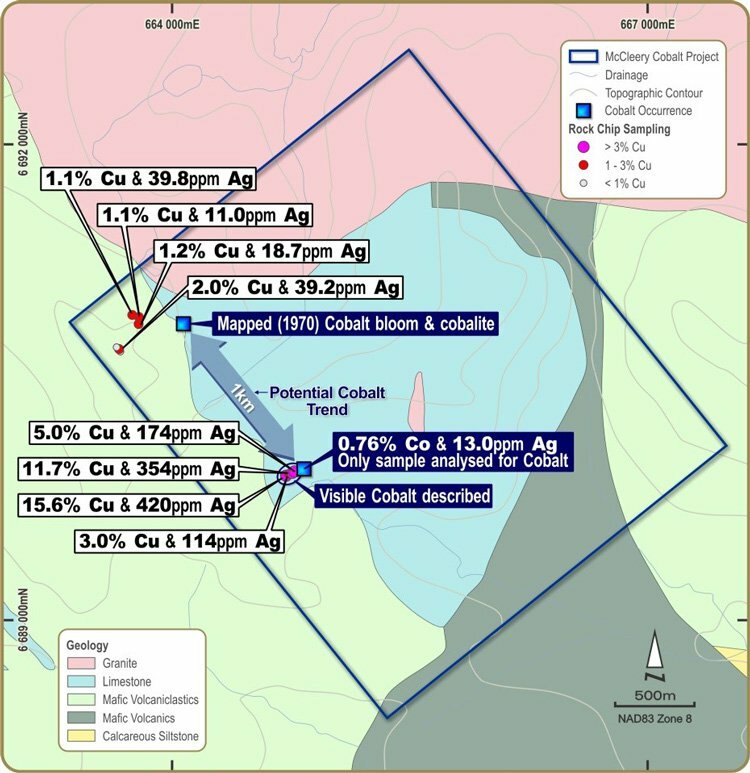 With previous exploration focusing on copper mineralisation, given current market sentiment on cobalt, today’s company saw upside in the cobalt play, with historical reports indicating only one sample from the Project had ever been assayed for cobalt – returning 0.76% Co and 14g/T Ag. These numbers and the fact that no exploration had previously focused on cobalt, were enough for the company to add another metal to its growing and quite substantial portfolio. This is an early stage cobalt play, but as cobalt continues a very bullish run due to its place in the ever growing battery market.... Watch this space. This company now has all the pieces in place to rapidly progress towards its first gold sales, which it hopes to see within 12-18 months and the company’s Canadian assets could bring more good cheer. 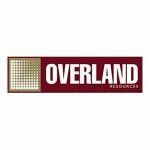 Overland Resources (ASX: OVR) is a bit of a gold bug – with a handy zinc and cobalt upside to boot – and late last year the company secured an option to acquire and develop the Trojan Gold Project near Kalgoorlie in WA. The timing could have hardly been better with gold prices recovering with aplomb, and the valuations placed on a series of Aussie gold miners being pulled higher at the time. While gold prices have fluctuated, they have remained strong and thus OVR wants to join the rank and file of previously successful Aussie metals companies, specifically those on the lookout for gold. This gold allure could have something to do with gold prices having found a footing above US$1,200/oz (A$1,600/oz) and looking likely to stay there. Some analysts are calling for even higher gold prices and while we don’t have a crystal ball, we do have an eye for well-priced small caps. The fact that market conditions are now improving, suggests that a little $5 million-capped nugget like OVR could end up with bigger valuations sooner rather than later, as the recovery gathers momentum and gold prices gather altitude. Not to mention the company’s advanced zinc play and recent exposure to cobalt to add to the valuation upside mix. 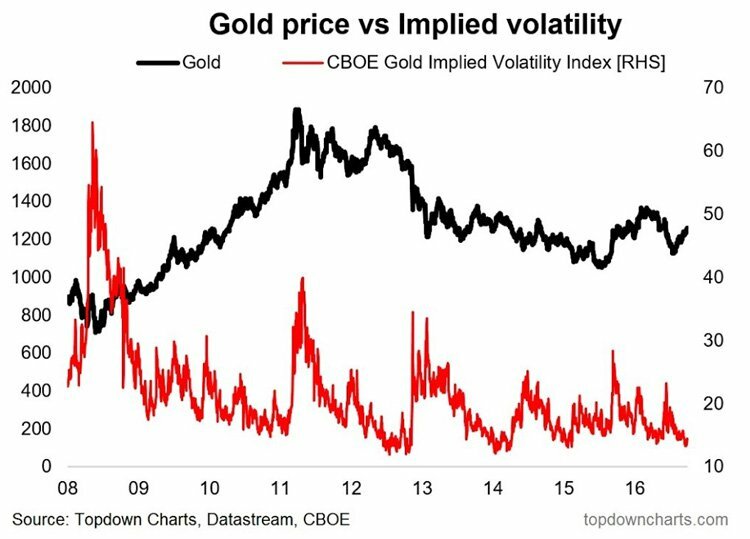 Despite intermittent spikes in gold price volatility, gold prices have remained broadly stable. 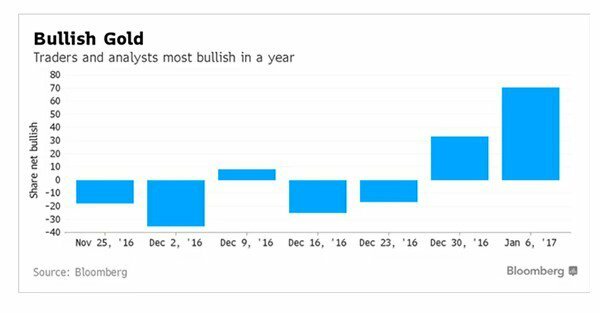 Bloomberg found that around 70% of market participants are bullish on gold prices; up from around 35% a year earlier. That wouldn’t have anything to do with a certain property tycoon with bad hair, would it? It should be noted here that commodity prices do fluctuate and caution should be applied to any investment decision here and not be based on spot prices alone. Seek professional financial advice before choosing to invest. Step one in capitalising on the gold market’s strength is obtaining a high quality, robust gold Project. OVR is in an area littered with processing facilities, ore distribution infrastructure, and customers in a region that’s seen a staggering amount of gold production in the past. The Kalgoorlie region of Western Australia is home to the 50 million ounce Super Pit and many other multi-million ounce production centres. OVR acquired a robust gold project in WA with two existing open-pit mines and its first trickle of production already in sight. 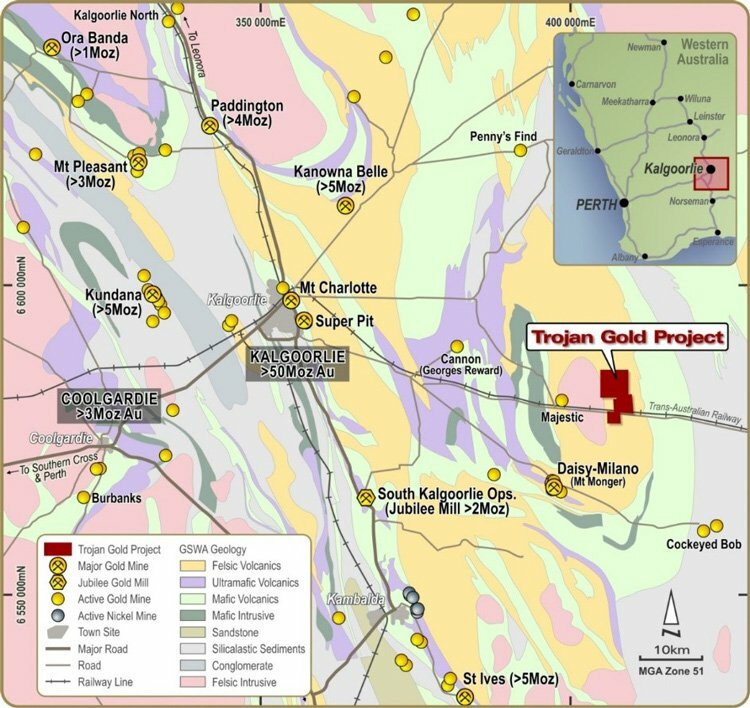 The Trojan Gold Project provides OVR with a prime opportunity to generate significant cashflow in the near term. Historically, approximately 130,000oz of gold was mined from the two open pits within OVR’s project area. 2Mt was mined from the Trojan open pit at a grade of 1.97 g/t gold (for ~125,000oz of gold) with mining completed in 2004. Whilst approximately 31,000 tonnes of ore was mined at the Transfind open pit between 1991 and 1992 at the higher grade of 4.9g/t gold (for ~4,900oz of gold). The previous operators left plenty behind here, with OVR quoting a pre-mining resource at Transfind of 69,000T @ 5.7g/t Au for 12,650 oz of gold – although remember only the 4,900 oz was mined. The Transfind pit reportedly closed prematurely due to a variety of factors including the gold price at the time, an in-pit slip, and some issues with historic workings. This left remnants of the high grade resource behind that could easily be mined today, including hits like 3m @ 343 g/t in an unmined area. The last time Trojan coughed up any gold was in 2004, back when gold prices were in the $425/oz range. Approximately 145,000oz of unmined gold resources remain both below, and along strike from the Trojan open pit. This is with none of the quoted resource attributed to the Transfind pit area, with its high grade and high potential for rapid resource expansion. Even a quick back of the envelope calculation suggests the Trojan Project has plenty of tangible gold which could generate cashflow for several years, depending on the rate of production. 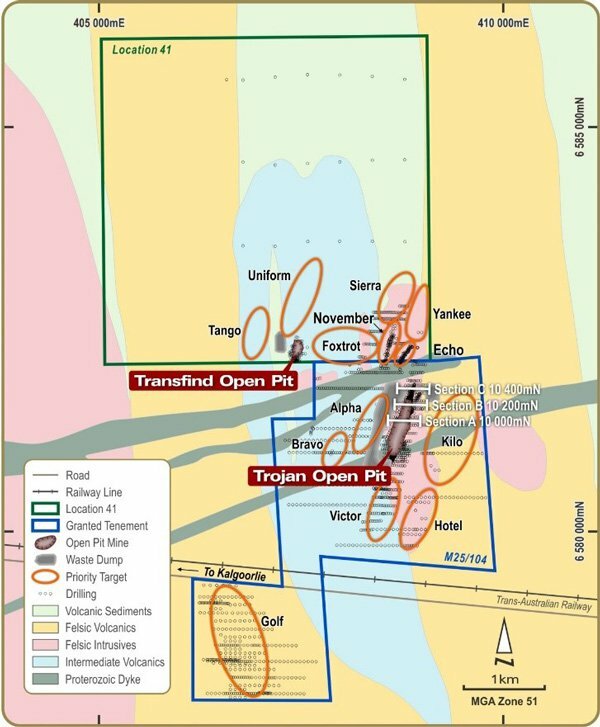 From The Trojan Project you can even see and hear the activities at the currently producing Majestic open pit operated by the $300 million capped Silver Lake Resources (ASX:SLR). This is part of the Daisy Milano – Mt Monger operation. On top of the indicated and inferred resources, OVR has over a dozen priority exploration targets which will be summarily drilled and hopefully added to its Resource inventory. The northern part of the licence is so under-explored it isn’t even assigned a target name yet, but blue sky potential exists north of these known targets. OVR is hedging its bets by adding some base metals nutrition to its Resources recipe. 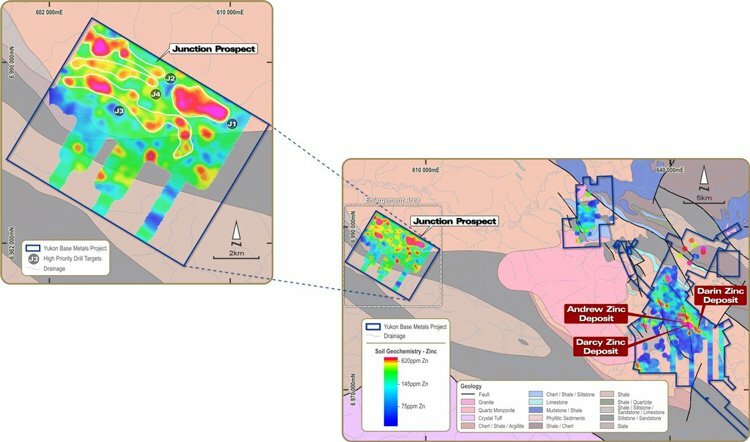 OVR went straight for the jugular when it acquired the Yukon Base Metal Project spanning 350 square kilometres in the Yukon Territory, Canada. Since acquisition, OVR has completed numerous drilling programs resulting in the definition of a JORC Resource based on over 350 diamond core holes. Importantly, OVR has already established metallurgical properties and processing requirements, open-pit mining criteria and commenced various studies including environmental and heritage surveys. OVR also has a completed a PFS mining study that it is currently re-assessing. As you can see, OVR’s resource is large and high grade with the majority of the resources falling into the Measured and Indicated categories and all three deposits open at depth there is obvious future expansion potential. OVR is currently re-evaluating various development scenarios for the Yukon Project to identify the best route to production. Due to its hefty size, OVR will most likely need to spend somewhere between $150-200 million in order to take Yukon into full-scale production. These funds could be tapped as part of a JV deal — an avenue OVR is actively exploring. If we take a look at OVR’s 2012 Mining Study, we can see that its Yukon Project could yield a 7 year mine life, extracting 8Mt @ 5% Zn and 1.5% Pb. And remember, these are the current estimates without including exploration drilling in order to expand this resource further. OVR has no further expenditure obligations until at least 2026, and can maintain the Yukon Project in good standing at no cost. As always the best way to add value to a Project is to increase the overall tonnage and grade of the project and OVR has a great opportunity to do both these with first-pass drilling at its very highly regarded Junction Prospect. The Junction Prospect sits just 20km from the main resource area and comprises 4 high priority drill targets with blue sky potential for the discovery of additional mineral resources. Soil sampling at Junction in 2014/15 defined extensive zinc-in-soil anomalism, with values returning up to 0.45% Zn and 6.1g/t Ag in soil samples... that is in soils not drill holes... and that’s massive. All four anomalies are greater than 2,000m long with minimal outcrop in the area. The size and grade of the anomalies at Junction compare favourably to those present at the three existing deposits at the Yukon Project, but hopefully the similarities don’t end there. But all these targets are yet to be drilled – so what lies beneath the surface remains to be determined. The chance of discovering additional tonnes that could be added to a production scenario in the Yukon is very high. We will likely see some significant progress in OVR’s Canadian zinc intentions in the near future. OVR has added copper-cobalt to its mix, and is writing new chapter. Sticking with the Canadian theme, on April 12 OVR announced the acquisition of a copper-cobalt project also in the Yukon – the McCleery Copper-Cobalt Project. The opportunity to acquire this project seemed too good to pass up as OVR was able to secure a 100% interest in the Project at minimal cost by staking new claims. What this means for the company remains to be seen and investors considering this stock for their portfolio should take all public information into account and a cautious approach to their investment decision. As we’ve discussed, OVR already has a strong presence in the Yukon, so the acquisition of an underexplored cobalt region was too good to forgo. 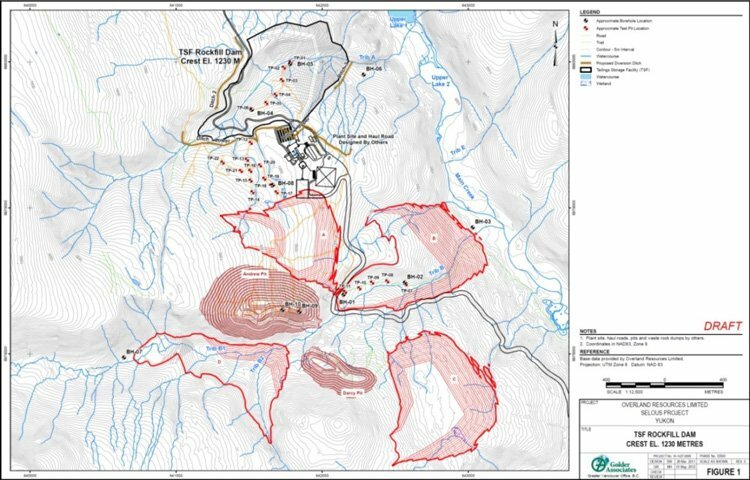 The McCleery Project comprises 42 claims that cover approximately 9 km 2 and is located 170 km south-east of the Yukon’s capital, Whitehorse, and 40km north-east of the community of Teslin in south-central Yukon. A tractor trail/winter road provides access from the Alaska Highway to within 10km of the Project. Minimal exploration has been undertaken in the Project area in the past; with the most recent work having been undertaken in 1983. The first recorded exploration in the area was by Atlas Explorations Limited (Atlas), in 1970. Geological mapping was conducted, with two copper showings and a cobalt showing identified in skarns. No assays are reported. Several other showings in the area were reported to host cobalt minerals, including cobalt bloom, a secondary cobalt mineral known as erythrite and cobaltite (cobalt sulphide). The more significant, reported cobalt occurrences are separated by about 1km, with favourable lithologies present between them. OVR is confident no drilling has ever been undertaken at the McCleery Project, and it appears that no work has been completed there since 1983. OVR sports no long-term debt on its balance sheet and for a small-cap company — with a market cap of just under $5 million — financial flexibility is a valuable trait. With open-pit mining possibly commencing in the next 12-18 months... we could see OVR experiencing its first revenues within this time. All in all, OVR’s gold project remains the priority in the near-term, with a serious zinc project and early stage cobalt project waiting in the wings setting OVR up for a busy 2017. The opportunity here is to emulate hugely successful metals developers around the globe, currently seeing their fortunes changing again on the back of resurging metal prices. With gold, base and exotic metals finding their feet globally, now may be time to find some small-cap market morsels before they start bulging in the public limelight, so we are keeping a close eye on OVR.